I am using the detention basin calculator to evaluate the effects of small detention ponds to help reduce increases in peak flows. I am hoping to understand the difference between the Circular Riser and Standpipe options in the "Define outflow Discharges" dialog. It seems to me that a circular riser is the same as a circular standpipe, Is this correct? Could someone point me to a reference or explain the difference between the two? The short answer to your question is that a riser has a vertical hole on the side of the pipe, where the standpipe has a horizontal pipe . To be sure that I'm clear I'll give the long answer. There are four discharge structures in the Hydraulic Toolbox Detention Basin Calculator: Weir, Standpipe, Riser, and known discharge. The Weir determines the flow that is available by using only Weir Flow. 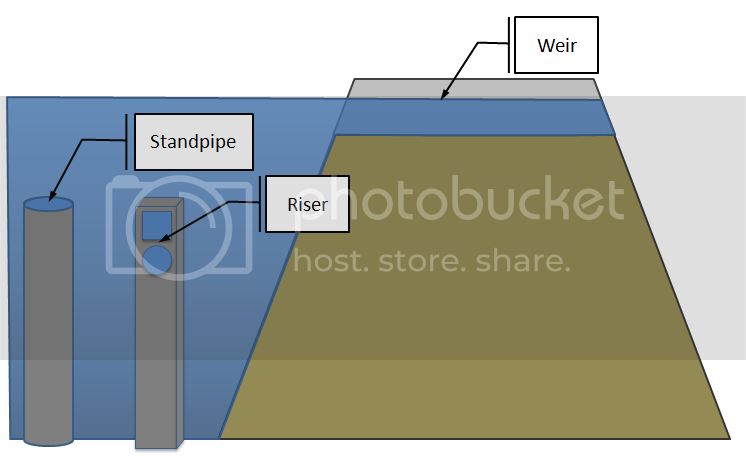 The Standpipe uses weir flow along the circumference of the pipe, until orifice dominates. The Riser uses weir flow across the submerged section of the hole (depending on shape and size) until orifice flow dominates. The top of the riser is closed. Known Discharge is where the user specifies a discharge for a depth and no discharge calculations are performed by the toolbox. Thanks Eric, the figure is very helpful for understanding the different options.